The Agassiz Baldwin Community is a place that nurtures individual growth and creativity, builds connections, and serves as a forum for community advocacy. We believe in: welcoming and including everyone; lifelong learning; and fostering a culture of creativity and cooperation. 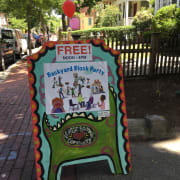 We are looking for volunteers to help us run our annual, family-friendly Backyard Block Party on Sunday, June 2nd from 12-4pm. There will be free activities that are fun for all ages showcasing our beautiful backyard, Maud Morgan Art Center, and children's programs space.